Our client, Kelly, was walking his dog on West Marine Drive in Port Angeles near the Platypus Marine Shipyard one morning in July 2016 when an accident changed his life forever. The 59-year-old was crossing an intersection when a logging truck struck and severely injured him. According to law enforcement records, the logging truck driver failed to come to a complete stop at the intersection. The driver then “lurched forward” while attempting a left-hand turn, never checking for traffic and/or pedestrians. The driver was cited for failure to yield to a pedestrian. The driver’s actions caused serious damage to Kelly. Kelly was knocked unconscious before he could hit the ground. The retiree was taken by ambulance to Olympic Medical Center, but when it was discovered he had sustained a skull fracture and multiple broken bones in his leg, he was airlifted to Harborview Medical Center in Seattle where he underwent immediate surgery. He spent two days in intensive car and eight days in total in the hospital. Ultimately, Kelly sustained a cranial bleed, skull fracture, a traumatic brain injury with balance and memory issues, a tibial plateau fracture, as well as a loss of smell and taste. The serious and life-threatening nature of Kelly’s injuries resulted in medical bills well over six figures. Accidents involving large trucks and other commercial vehicles are typically catastrophic, making the decision to hire the right personal injury attorney critical. Kelly’s family contacted Seattle-based law firm Davis Law Group, P.S., two weeks after the incident. Attorney Chris Davis’ nearly 25 years of experience handling semi-truck and other commercial vehicle cases made him the right choice for Kelly and his family. Mr. Davis quickly began diving into Kelly’s case. 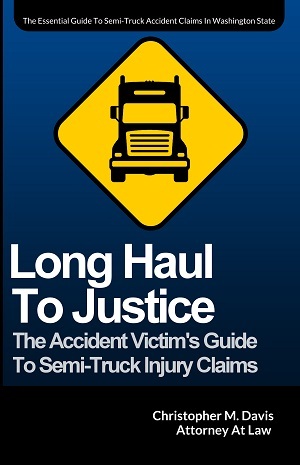 As with all accidents involving large trucks and commercial trucking companies, all aspects of the case were examined, including the driver’s history, the company’s safety standards, the accident scene, as well as consult and cross-examine multiple experts. In cases involving commercial vehicles, it’s important that the victim’s attorney has the necessary financial resources to see the case through to the end. These claims often take years to complete – Kelly’s took about a year-and-a-half – and it must be clear to the trucking company and their legal defense that the victim’s lawyer is willing to go to trial if necessary. In late 2017, Mr. Davis and his legal team began preparing for trial. Fortunately, Davis Law Group was able to bring the case to a stress-free and satisfying conclusion. With the trial date rapidly approaching, Mr. Davis successfully negotiated a $1 million settlement on behalf of Kelly and his family, which ensured he would have the best chance at recovering from his injuries and getting his life back to normal after such a traumatic collision. We recovered a $1 million settlement for a man who was seriously injured after being struck as a pedestrian by a logging truck. Our client suffered a skull fracture and multiple broken bones in his legs.